FALLSDELL Machinery Pty Ltd has launched another high quality line to its extensive range of process equipment. Fallsdell Inline and Batch Emulsifiers, part of the Fallsdell Line, are available in a range of different models, including the New Stainless Steel Motor version. To complement this range, the company has also introduced the Ross Line of emulsifiers. The Ross stators are available in different sizes and shapes. The Inline Mixer Emulsifier comes in three different versions and is suitable for a various range of applications. It can be adopted to any machine for a variety of different processing operations including blending, mixing, emulsifying, homogenising, disintegrating solids and suspending. 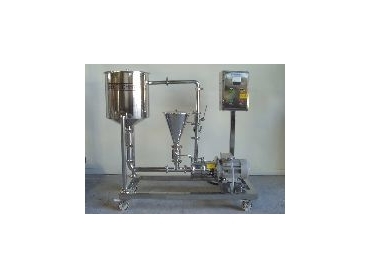 There are seven different emulsifier models ranging from the Model 405, with a capacity of 650L/min, right through to the Model 475, with a capacity of 5200L/min, all constructed out of 316 grade stainless steel. All models are also hygienic. The units have already been sold for many food applications, including chocolate coatings, fruit syrups, mustards, pancake batter, salad dressings, soft drinks, mayonnaise, tomato sauce, flavour emulsions and sugar solutions. Typical inline applications include liquid-liquid mixing, liquid-solid disintegration/dispersion and liquid-solid recirculation system. The Inline Mixer is also available with a Full Venturi system designed for adding powders into liquid. Together with the Inline Mixer, the Ross range also has a Batch Emulsifier with funnel, again designed to allow powders into the liquid mix.